Picked these up with the Bristol discount code on Panini.com. It said the first 200 orders should have received a bonus card, but I didn't get one. I'll have to contact them about that because I ordered as soon as I saw the promo email. Just hoping to complete a set and get a few cool hits. All in all I got my full 200 card set and I'm 7 cards away from a 2nd full set. 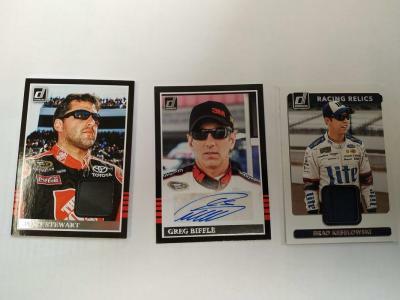 I already had a Biffle autograph so that one is for trade if anyone needs it. 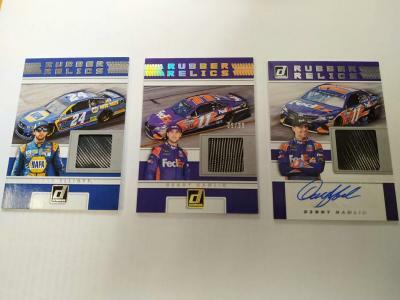 The Hamlin auto is pretty cool, didn't have any of his. I like Keselowski relics and autos so I'm keeping that. Everything else is for trade. I have the Jr vars. any xtra base ?!? Last edited by TyrantsASupremeBeing; 04-12-2019 at 11:16 AM. Yep looks like I have #2 Dale Jr Race Kings and #153 Dale Jr. Legends available. Let me look through your stuff and I'll get back to you.